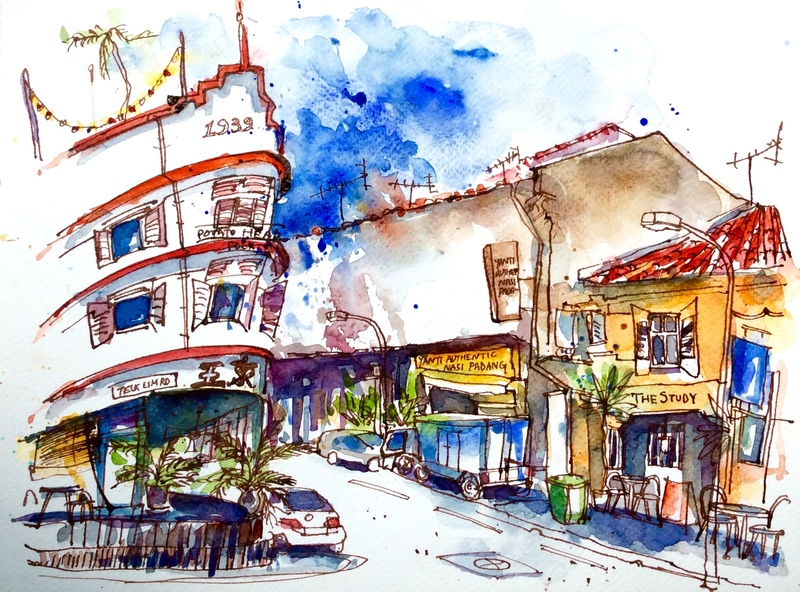 It so happened that on a bright sunny, excruciatingly hot and humid morning, a bunch of sketchers descended on Keong Saik Road and captured the five-footways of its shophouses for three hours of intensive sketching. Easels were set up, field chairs were pulled out, pigments, palettes, brushes, pens, pencils, charcoal, mounds of Artist grade paper and large plastic mugs of water appeared. Rolls of kitchen towels and packets of tissues were kept by the side. Sunscreen was rubbed, sunglasses were donned and stretchy UV protecting sleeves were worn on arms. Wide brimmed hats and baseball caps crowned every head. And while we braved through the day, observing, sketching, painting and spurring each other on beads of sweat trickled down our backs and bloomed on our foreheads. In the absence of breeze, not a single leaf or a strand of hair moved. The air’s oppressive stillness clung the clothes to our bodies, forming dark, damp patches. But then just as the morning turned into afternoon and became increasingly heavy with languor, respite came. I was at the intersection of Keong Saik and Teck Lim Road, sketching this iconic pre-war building with bright red borders when I saw a uniformed staff of Potato Head Folk – a burger joint that replaced the famous 75 year old Tong Ah Eating House- approach us lugging a bucket filled with green glass bottles. “Here, have one”, she said handing me a chilled bottle of mineral water. I may have snatched it and gulped its entire content down my parched throat before thanking her. ‘No worries. My boss saw you’ll sketching in the heat, so he sent these’, she added and moved on to other dehydrated souls. The weather continued to be gruelling but Mr. Potato Head’s benevolence had already injected vigour into the listless air. We picked up our brushes and marched on. This entry was posted in Daily Vignettes and tagged Art Deco, brush, chinatown, drawing, illustration, Keong Saik, Keong Saik Road, Mr. 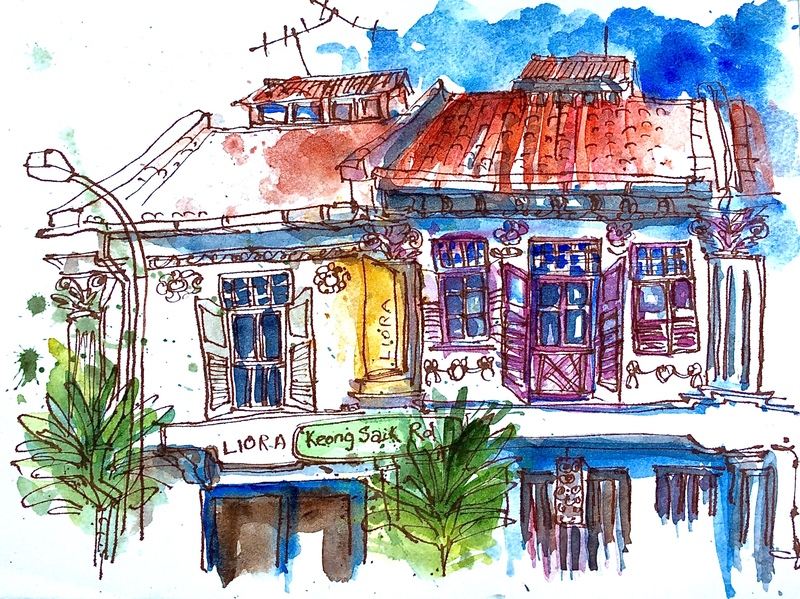 Potato Head, pigments, Potato Head, Potato Head Folk, Shophouses, Singapore, sketching, Teck Lim Road, Tong Ah Eating House on June 17, 2015 by Somali Roy.